Vladivostok (Russian: Владивосто́к, IPA: [vlədʲɪvɐˈstok] (listen), literally ruler of the east) is a city and the administrative centre of Far Eastern Federal District and Primorsky Krai, Russia, located around the Golden Horn Bay, not far from Russia's borders with China and North Korea. The population of the city as of 2017 was 606,589, up from 592,034 recorded in the 2010 Russian census. Harbin in China is about 515 kilometres (320 mi) away, whilst Sapporo in Japan is about 775 kilometres (482 mi) east across the Sea of Japan. The city is the home port of the Russian Pacific Fleet and the largest Russian port on the Pacific Ocean. Vladivostok was first named in 1859 along with other features in the Peter the Great Gulf area by Nikolay Muravyov-Amursky. The name first applied to the bay but, following an expedition by Alexey Shefner in 1860, was applied to the new settlement. In Chinese, the place where the city is situated nowadays has been known since the Qing Dynasty as Haishenwai (海參崴, Hǎishēnwǎi), from the Manchu Haišenwai (Manchu: ᡥᠠᡳᡧᡝᠨᠸᡝᡳ; Möllendorff: Haišenwai; Abkai: Haixenwai) or "small seaside village". As the Manchu Qing Dynasty (1644–1911) banned Han Chinese from most of Manchuria (including the Vladivostok region), it was only visited by shēnzéi (參賊, ginseng or sea cucumber thieves) who illegally entered the area seeking ginseng or sea cucumbers (ambiguous, since both words use the Chinese 參, shēn). From this comes the Chinese name for the city, Hǎishēnwǎi (海參崴, usually translated roughly as "sea-cucumber cliffs"). In modern-day China, Vladivostok is officially known by the transliteration 符拉迪沃斯托克 (Fúlādíwòsītuōkè), although the historical Chinese name 海參崴 (Hǎishēnwǎi) is still often used in common parlance and outside mainland China to refer to the city. According to the provisions of the Chinese government, all maps published in China have to bracket the city's Chinese name. The modern-day Japanese name of the city is transliterated as Urajiosutoku (ウラジオストク). Historically, the city was written in Kanji as 浦塩斯徳 and shortened to Urajio ウラジオ; 浦塩. In Korean, the name is transliterated as Beulladiboseutokeu (블라디보스토크) in South Korea, Ullajibosŭttokhŭ (울라지보스또크) in North Korea and China. The aboriginals of the territory on which modern Vladivostok is located are the Udege minority, and a sub-minority called the Taz which emerged through members of the indigenous Udege mixing with the nearby Chinese and Hezhe. The region had been part of many states, such as the Mohe, Balhae Kingdom, Liao Dynasty, Jīn Dynasty, Yuan Dynasty, Ming Dynasty, Qing Dynasty and various other Chinese dynasties, before Russia acquired the entire Maritime Province and the island of Sakhalin by the Treaty of Beijing (1860). Qing China, which had just lost the Opium War with Britain, was unable to defend the region. The Manchu emperors of China, the Qing Dynasty, banned Han Chinese from most of Manchuria including the Vladivostok area (see Willow Palisade)—it was only visited by illegal gatherers of ginseng and sea cucumbers. On 20 June 1860 (2 July for Gregorian style), the military supply ship Manchur, under the command of Captain-Lieutenant Alexey K. Shefner, called at the Golden Horn Bay to found an outpost called Vladivostok. Warrant officer Nikolay Komarov with 28 soldiers and two non-commissioned officers under his command were brought from Nikolayevsk-on-Amur by ship to construct the first buildings of the future city. The Manza War in 1868 was the first attempt by Russia to expel Chinese from territory it controlled. Hostilities broke out around Vladivostok when the Russians tried to shut off gold mining operations and expel Chinese workers there. The Chinese resisted a Russian attempt to take Ashold Island and in response, two Russian military stations and three Russian towns were attacked by the Chinese whom the Russians failed to oust. An elaborate system of fortifications was erected between the early 1870s and the late 1890s. A telegraph line from Vladivostok to Shanghai and Nagasaki was opened in 1871. That same year a commercial port was relocated to Vladivostok from Nikolayevsk-on-Amur. Town status was granted on 22 April 1880. A coat of arms, representing the Siberian tiger, was adopted in March 1883. The first high school was opened in 1899. The city's economy was given a boost in 1916, with the completion of the Trans-Siberian Railway, which connected Vladivostok to Moscow and Europe. After the October Revolution, the Bolsheviks took control of Vladivostok and all the Trans-Siberian Railway. During the Russian Civil War they were overthrown by the White-allied Czechoslovak Legion, who declared the city to be an Allied protectorate. Vladivostok became the staging point for the Allies' Siberian intervention, a multi-national force including Japan, the United States, and China; China sent forces to protect the local Chinese community after demands on their merchants. The intervention ended in the wake of the collapse of the White Army and regime in 1919; all Allied forces except the Japanese withdrew by the end of 1920. In April 1920, the city came under the formal governance of the Far Eastern Republic, a Soviet-backed buffer state between the Soviets and Japan. Vladivostok then became the capital of the Japanese-backed Provisional Priamurye Government, created after a White Army coup in the city in May 1921. The withdrawal of Japanese forces in October 1922 spelt the end of the enclave, with Ieronim Uborevich's Red Army taking the city on 25 October 1922. As the main naval base of the Soviet Pacific Fleet, Vladivostok was officially closed to foreigners during the Soviet years. The city hosted the summit at which Leonid Brezhnev and Gerald Ford conducted the Strategic Arms Limitation Talks in 1974. At the time, the two countries decided quantitative limits on nuclear weapons systems and banned the construction of new land-based ICBM launchers. In 2012, Vladivostok hosted the 24th APEC summit. Leaders from the APEC member countries met at Russky Island, off the coast of Vladivostok. With the summit on Russky Island, the government and private businesses inaugurated resorts, dinner and entertainment facilities, in addition to the renovation and upgrading of Vladivostok International Airport. Two giant cable-stayed bridges were built in preparation for the summit, namely the Zolotoy Rog bridge over the Zolotoy Rog Bay in the center of the city, and the Russky Island Bridge from the mainland to Russky Island (the longest cable-stayed bridge in the world). The new campus of Far Eastern Federal University was completed on Russky Island in 2012. Locals call Vladivostock also Vladik. The city is located in the southern extremity of Muravyov-Amursky Peninsula, which is about 30 kilometers (19 mi) long and 12 kilometers (7.5 mi) wide. The highest point is Mount Kholodilnik, 257 meters (843 ft). Eagle's Nest Hill is often called the highest point of the city; but, with a height of only 199 meters (653 ft), or 214 meters (702 ft) according to other sources, it is the highest point of the downtown area, but not of the whole city. Vladivostok has a monsoon-influenced humid continental climate (Köppen climate classification Dwb) with warm, humid and rainy summers and cold, dry winters. Owing to the influence of the Siberian High, winters are far colder than a latitude of 43 degrees north should warrant given its low elevation and coastal location, with a January average of −12.3 °C (9.9 °F). Since the maritime influence is strong in summer, this results in a relatively cold annual climate given said latitude. Vladivostok's yearly mean of around 5 °C (41 °F) is some ten degrees lower than in cities on the French Riviera on a similar coastal latitude in Europe on the other extreme. Winters especially are around 20 °C (36 °F) colder than on the mildest coastlines this far north. In winter, temperatures can drop below −20 °C (−4 °F) while mild spells of weather can raise daytime temperatures above freezing. The average monthly precipitation, mainly in the form of snow, is around 18.5 millimeters (0.73 in) from December to March. Snow is common during winter, but individual snowfalls are light, with a maximum snow depth of only 5 centimeters (2.0 in) in January. During winter, clear sunny days are common. Summers are warm, humid and rainy, due to the East Asian monsoon. The warmest month is August, with an average temperature of +19.8 °C (67.6 °F). Vladivostok receives most of its precipitation during the summer months, and most summer days see some rainfall. Cloudy days are fairly common and because of the frequent rainfall, humidity is high, on average about 90% from June to August. On average, Vladivostok receives 840 millimeters (33 in) per year, but the driest year was 1943, when 418 millimeters (16.5 in) of precipitation fell, and the wettest was 1974, with 1,272 millimeters (50.1 in) of precipitation. The winter months from December to March are dry, and in some years they have seen no measurable precipitation at all. Extremes range from −31.4 °C (−24.5 °F) in January 1931 to +33.6 °C (92.5 °F) in July 1939. Head of the city of Vladivostok on the principles of unity of command directs the administration of the city of Vladivostok in accordance with federal laws, the laws of the Primorsky Krai, and the charter of the city. The structure of the city administration has the City Council at the top. Other authority in accordance with Article 6 of the Charter, as well as powers delegated by federal law, the laws of the jurisdiction of Primorsky Krai executive and administrative body of the local government of city district. Legislative authority is vested in the City Council. The new City Council began operations in 2001 and on 21 June, deputies of the Duma of the first convocation of Vladivostok began their work. On 17 December 2007, the Duma of the third convocation began. The deputies consist of 35 elected members, including 18 members chosen by a single constituency, and 17 deputies from single-mandate constituencies. Vladivostok is the administrative centre of the krai. Within the framework of administrative divisions, it is, together with five rural localities, incorporated as Vladivostok City Under Krai Jurisdiction—an administrative unit with the status equal to that of the districts. As a municipal division, Vladivostok City Under Krai Jurisdiction is incorporated as Vladivostoksky Urban Okrug. The population of the city, according to the 2010 Census, is 592,034, down from 594,701 recorded in the 2002 Census. This is further down from 633,838 recorded in the 1989 Census. Following the 2009 recession the population of the city has continuously increased to 606,653 as of 2016 Ethnic Russians make up the majority of the population. The city's main industries are shipping, commercial fishing, and the naval base. Fishing accounts for almost four-fifths of Vladivostok's commercial production. Other food production totals 11%. A very important employer and a major source of revenue for the city's inhabitants is the import of Japanese cars. Besides salesmen, the industry employs repairmen, fitters, import clerks as well as shipping and railway companies. The Vladivostok dealers sell 250,000 cars a year, with 200,000 going to other parts of Russia. Every third worker in the Primorsky Krai has some relation to the automobile import business. In recent years, the Russian government has made attempts to improve the country's own car industry. This has included raising tariffs for imported cars, which has put the car import business in Vladivostok in difficulties. To compensate, Prime Minister Vladimir Putin ordered the car manufacturing company Sollers to move one of its factories from Moscow to Vladivostok. The move was completed in 2009, and the factory now employs about 700 locals. It is planned to produce 13,200 cars in Vladivostok in 2010. The Trans-Siberian Railway was built to connect European Russia with Vladivostok, Russia's most important Pacific Ocean port. Finished in 1905, the rail line ran from Moscow to Vladivostok via several of Russia's main cities. Part of the railroad, known as the Chinese Eastern Line, crossed over into China, passing through Harbin, a major city in Manchuria. Today, Vladivostok serves as the main starting point for the Trans-Siberian portion of the Eurasian Land Bridge. Vladivostok is the main air hub in the Russian Far East. Vladivostok International Airport (VVO) is the home base of Aurora airline - a Russian Far East air carrier, a subsidiary of Aeroflot. The airline was formed by Aeroflot in 2013 by amalgamating SAT Airlines and Vladivostok Avia. The Vladivostok International Airport was significantly upgraded in 2013 with a new 3500-metre runway capable of accommodating all aircraft types without any restrictions. The Terminal A was built in 2012 with a capacity of 3.5 million passengers per year. International flights connect Vladivostok with South Korea, Japan, China, North Korea, Philippines and Vietnam. It is possible to get to Vladivostok from several of the larger cities in Russia. Regular flights to Seattle, Washington, were available in the 1990s but have been cancelled since. Vladivostok Air was flying to Anchorage, Alaska, from July 2008 to 2013, before its transformation into Aurora airline. Vladivostok is the starting point of Ussuri Highway (M60) to Khabarovsk, the easternmost part of Trans-Siberian Highway that goes all the way to Moscow and Saint Petersburg via Novosibirsk. The other main highways go east to Nakhodka and south to Khasan. On 28 June 1908, Vladivostok's first tram line was started along Svetlanskaya Street, running from the railway station on Lugovaya Street. On 9 October 1912, the first wooden cars manufactured in Belgium entered service. Today, Vladivostok's means of public transportation include trolleybus, bus, tram, train, funicular, and ferryboat. The main urban traffic lines are City Centre—Vtoraya Rechka, City Centre—Pervaya Rechka—3ya Rabochaya—Balyayeva, and City Centre—Lugovaya Street. In 2012, Vladivostok hosted the 24th Summit of the Asia-Pacific Economic Cooperation (APEC) forum. In preparation for the event, the infrastructure of the city was renovated and improved. Two giant cable-stayed bridges were constructed in Vladivostok, namely the Zolotoy Rog Bridge over the Golden Horn Bay in the centre of the city, and the Russky Bridge from the mainland to Russky Island, where the summit took place. The latter bridge is the longest cable-stayed bridge in the world. The port is ice-free all year round (with the help of ice breakers), and in 2002 had a foreign trade turnover worth $275 million. In 2015, a special economic zone has been settled with the free port of Vladivostok. The Presidium of the Far Eastern Division of the Russian Academy of Sciences (ДВО РАН) as well as ten of its research institutes are also located in Vladivostok, as is the Pacific Research Institute of Fisheries and Oceanography (Тихоокеанский научно-исследовательский рыбохозяйственный центр or ТИНРО). Over fifty newspapers and regional editions to Moscow publications are issued in Vladivostok. The largest newspaper of the Primorsky Krai and the whole Russian Far East is Vladivostok News with a circulation of 124,000 copies at the beginning of 1996. Its founder, joint-stock company Vladivostok-News, also issues a weekly English-language newspaper Vladivostok News. The subjects of the publications issued in these newspapers vary from information about Vladivostok and Primorye, to major international events. Newspaper Zolotoy Rog (Golden Horn) gives every detail of economic news. Entertainment materials and cultural news constitute a larger part of Novosti (News) newspaper which is the most popular among Primorye's young people. Also, new online mass media about the Russian Far East for foreigners is the Far East Times. This source invites readers to take part in informational support of R.F.E. for visitors, travellers and businessmen. Vladivostok operates many online media outlets - newsvl, primamedia, and primorye24. As of 1999, there are also seven radio stations, the most popular being 24-hour VBC (612 kHz, 101.7 MHz) and Europa+ (738 kHz, 104.2 MHz). Europa+ normally broadcasts popular modern British-American music, while the ratio of Russian and foreign songs over VBC is fifty-fifty. Every hour one can hear local news over these radio stations. Radio Vladivostok (1098 kHz) operates from 06:00 till 01:00. It broadcasts several special programs which are devoted to the music of the 1950s-1980s as well as new-age. Maxim Gorky Academic Theatre, named after the Russian author Maxim Gorky, was founded in 1931 and is used for drama, musical and children's theatre performances. In September 2012, a granite statue of the actor Yul Brynner (1920–1985) was inaugurated in Yul Brynner Park, directly in front of the house where he was born at 15 Aleutskaya St. The Arsenyev Primorye Museum (Приморский государственный объединенный музей имени В.К. Арсеньева), opened in 1890, is the main museum of the Primorsky Krai. Besides the main facility, it has three branches in Vladivostok itself (including Arsenyev's Memorial House), and five branches elsewhere in the state. Among the items in the museum's collection are the famous 15th-century Yongning Temple Steles from the lower Amur. The city is home to the Vladivostok Pops Orchestra. Russian rock band Mumiy Troll hails from Vladivostok and frequently puts on shows there. In addition, the city hosted the "VladiROCKstok" International Music Festival in September 1996. Hosted by the mayor and governor, and organized by two young American expatriates, the festival drew nearly 10,000 people and top-tier musical acts from St. Petersburg (Akvarium and DDT) and Seattle (Supersuckers, Goodness), as well as several leading local bands. Nowadays there is another annual music festival in Vladivostok, Vladivostok Rocks International Music Festival and Conference (V-ROX). Vladivostok Rocks is a three-day open-air city festival and international conference for the music industry and contemporary cultural management. It offers the opportunity for aspiring artists and producers to gain exposure to new audiences and leading international professionals. The Russian Opera House houses the State Primorsky Opera and Ballet Theater. Parks and squares in Vladivostok include Pokrovskiy Park, Minnyy Gorodok, Detskiy Razvlekatelnyy Park, Park of Sergeya Lazo, Admiralskiy Skver, Skver im. Neveskogo, Nagornyy Park, Skver im. Sukhanova, Fantaziya Park, Skver Rybatskoy Slavy, Skver im. A.I.Shchetininoy. Pokrovskiy Park was once a cemetery. Converted into a park in 1934 but was closed in 1990. Since 1990 the land the park sits on belongs to the Russian Orthodox Church. During the rebuilding of the Orthodox Church, graves were found. Minny Gorodok is a 91-acre (37 ha) public park. Minny Gorodok means "Mine Borough Park" in English. The park is a former military base that was founded in 1880. The military base was used for storing mines in underground storage. Converted into a park in 1985, Minny Gorodok contains several lakes, ponds, and an ice-skating rink. Detsky Razvlekatelny Park is a children's amusement park located near the centre of the city. The park contains a carousel, gaming machines, a Ferris wheel, cafés, an aquarium, cinema, and a stadium. Admiralsky Skver is a landmark located near the city's centre. The Square is an open space, dominated by the Triumfalnaya Arka. South of the square sits a museum of Soviet submarine S-56. Local ecologists from the Ecocenter organization have claimed that much of Vladivostok's suburbs are polluted and that living in them can be classified as a health hazard. The pollution has a number of causes, according to Ecocenter geo-chemical expert Sergey Shlykov. Vladivostok has about eighty industrial sites, which may not be many compared to Russia's most industrialized areas, but those around the city are particularly environmentally unfriendly, such as shipbuilding and repairing, power stations, printing, fur farming, and mining. In addition, Vladivostok has a particularly vulnerable geography which compounds the effect of pollution. Winds cannot clear pollution from some of the most densely populated areas around the Pervaya and Vtoraya Rechka as they sit in basins which the winds blow over. In addition, there is little snow in winter and no leaves or grass to catch the dust to make it settle down. Vladivostok is home to the football club FC Luch-Energiya Vladivostok, who plays in the Russian First Division, ice hockey club Admiral Vladivostok from the Kontinental Hockey League's Chernyshev Division, and basketball club Spartak Primorye, who plays in the Russian Basketball Super League. In 2010, arches with the names of each of Vladivostok's twin towns were placed in a park within the city. From Vladivostok ferry port next to the train station, a ferry of the DBS Cruise Ferry travels regularly to Donghae, South Korea and from there to Sakaiminato on the Japanese main island of Honshu. ^ Энциклопедия Города России. Moscow: Большая Российская Энциклопедия. 2003. p. 72. ISBN 5-7107-7399-9. ^ "Обвиняемый во взятках мэр Владивостока подал в отставку". ^ "Генеральный план Владивостока". Archived from the original on July 10, 2014. Retrieved 2014-07-10. ^ "Ростелеком завершил перевод Владивостока на семизначную нумерацию телефонов" (in Russian). 2011-07-12. Retrieved 2016-11-26. ^ "Город Владивосток". Города России. Retrieved 28 June 2016. ^ a b Russian Federal State Statistics Service (21 May 2004). "Численность населения России, субъектов Российской Федерации в составе федеральных округов, районов, городских поселений, сельских населённых пунктов – районных центров и сельских населённых пунктов с населением 3 тысячи и более человек" [Population of Russia, Its Federal Districts, Federal Subjects, Districts, Urban Localities, Rural Localities—Administrative Centers, and Rural Localities with Population of Over 3,000] (XLS). Всероссийская перепись населения 2002 года [All-Russia Population Census of 2002] (in Russian). ^ “海参崴来自满语，意为‘海边的小渔村’”： 阳, 曹. "冰雪黑龙江 圣诞异国游--频道风采". 天津广播网. 天津人民广播电台交通广播. Retrieved 9 February 2018. ^ Narangoa 2014, p. 300. ^ Joana Breidenbach (2005). Pál Nyíri, Joana Breidenbach, ed. China inside out: contemporary Chinese nationalism and transnationalism (illustrated ed.). Central European University Press. p. 90. ISBN 963-7326-14-6. Retrieved 18 March 2012. in the Gulf of Peter the Great. They organized themselves and raided three Russian villages and two military posts. For the first time, this attempt to drive the Chinese out was unsuccessful. ^ "The Russian train experience". Retrieved 2014-02-21. ^ "Czech troops take Russian port of Vladivostok for Allies - 6 July 1918 - HISTORY.com". HISTORY.com. Retrieved 2016-06-22. ^ Joana Breidenbach (2005). Pál Nyíri, Joana Breidenbach, ed. China inside out: contemporary Chinese nationalism and transnationalism (illustrated ed.). Central European University Press. p. 90. ISBN 963-7326-14-6. Retrieved 18 March 2012. Then there occurred another story which has become traumatic, this one for the Russian nationalist psyche. At the end of the year 1918, after the Russian Revolution, the Chinese merchants in the Russian Far East demanded the Chinese government to send troops for their protection, and Chinese troops were sent to Vladivostok to protect the Chinese community: about 1600 soldiers and 700 support personnel. ^ Levy, Clifford J. "Crisis or Not, Russia Will Build a Bridge in the East," New York Times. 20 April 2009. ^ "Putin proposes Russky Island venue for APEC-2012". Vladivostok: Vladivostok News. January 31, 2007. Archived from the original on February 15, 2009. Retrieved February 11, 2009. ^ Williamson, Gail M.; Christie, Juliette (2012-09-18). "Aging Well in the 21st Century: Challenges and Opportunities". Oxford Handbooks Online: 89. doi:10.1093/oxfordhb/9780195187243.013.0015. ^ a b "Климат Владивостока" [Climate of Vladivostok]. Погода и Климат (Weather and Climate) (in Russian). Retrieved June 19, 2013. ^ "Vladivostok Climate Normals 1961–1990". National Oceanic and Atmospheric Administration. Retrieved 30 November 2015. ^ "Город Владивосток". Города России. ^ a b "Putin Is Turning Vladivostok into Russia's Pacific Capital" (PDF). Russia Analytical Digest. Institute of History, University of Basel, Basel, Switzerland (82): 9–12. July 12, 2010. Archived from the original (PDF) on July 6, 2011. ^ a b Oliphant, Roland (2010). "Ruler of the East: The City of Vladivostok Is a Mixture of Promise and Neglect". Russia Profile. ^ Ryzik, Melena (28 August 2013). "East by Far East: Vladivostok Rocks". The New York Times. ^ Starrs. "Russian Opera house". ^ "Sister cities". Vladivostok city administration (in Russian). Archived from the original on June 8, 2016. Retrieved October 3, 2014. ^ Во Владивостоке открыт сквер городов-побратимов (In Russian). Retrieved July 19, 2016. Законодательное Собрание Приморского края. Закон №161-КЗ от 14 ноября 2001 г. «Об административно-территориальном устройстве Приморского края», в ред. Закона №673-КЗ от 6 октября 2015 г. «О внесении изменений в Закон Приморского края "Об административно-территориальном устройстве Приморского края"». Вступил в силу со дня официального опубликования. Опубликован: "Красное знамя Приморья", №69 (119), 29 ноября 2001 г. (Legislative Assembly of Primorsky Krai. Law #161-KZ of November 14, 2001 On the Administrative-Territorial Structure of Primorsky Krai, as amended by the Law #673-KZ of October 6, 2015 On Amending the Law of Primorsky Krai "On the Administrative-Territorial Structure of Primorsky Krai". Effective as of the official publication date.). Законодательное Собрание Приморского края. Закон №179-КЗ от 6 декабря 2004 г. «О Владивостокском городском округе», в ред. Закона №48-КЗ от 7 июня 2012 г. «О внесении изменений в Закон Приморского края "О Владивостокском городском округе"». Вступил в силу 1 января 2005 г.. Опубликован: "Ведомости Законодательного Собрания Приморского края", №76, 7 декабря 2004 г. (Legislative Assembly of Primorsky Krai. Law #179-KZ of December 6, 2004 On Vladivostoksky Urban Okrug, as amended by the Law #48-KZ of June 7, 2012 On Amending the Law of Primorsky Krai "On Vladivostoksky Urban Okrug". Effective as of January 1, 2005.). Poznyak, Tatyana Z. 2004. Foreign Citizens in the Cities of the Russian Far East (the second half of the 19th and 20th centuries). Vladivostok: Dalnauka, 2004. 316 p. (ISBN 5-8044-0461-X). Stephan, John. 1994. The Far East a History. Stanford: Stanford University Press, 1994. 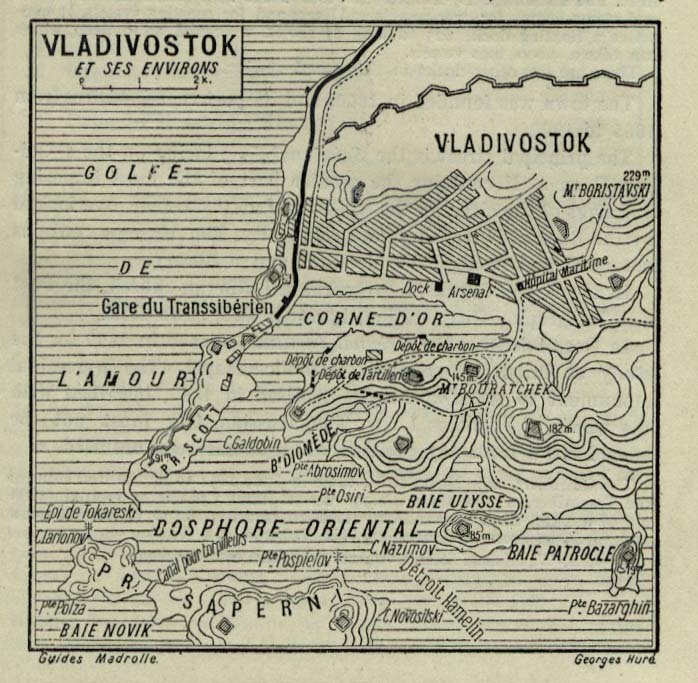 481 p.
Historical Map of Vladivostok (1912), Perry–Castañeda Library Map Collection, University of Texas, Austin. The APEC Russia 2012 (Russian: Саммит АТЭС Владивосток-2012) was the 24th annual gathering of APEC leaders. Leaders from the member economies met on Russky Island, off the coast of Vladivostok, Russia on September 9–10, 2012.The summit on Russky Island saw the resort, catering and entertainment facilities, in addition to the renovation and upgrading of Vladivostok International Airport.Two giant cable-stayed bridges were built in preparation for the summit, namely the Zolotoy Rog bridge over the Zolotoy Rog bay in the downtown, and Russky Island Bridge from mainland to Russky Island (which is the longest cable-stayed bridge in the world right now). The new campus of the Far Eastern Federal University was also completed on the island by 2012 to house the summit. Hockey Club Admiral (Russian: Хоккейный клуб Адмирал), commonly referred to as the Admiral Vladivostok, is a professional ice hockey team based in Vladivostok, Primorsky Krai, Russia. They are members of the Chernyshev Division of the Eastern Conference of the Kontinental Hockey League (KHL). Admiral play their home games at Fetisov Arena, which has a capacity of 7,500. Admiral joined the league in 2013 as an expansion team, which made them one of only two teams in the Russian Far East. Aleksandr Petrovich Kochetkov (Russian: Александр Петрович Кочетков; 28 October 1933 – 1 July 2015) was a Russian football player and coach. Allied intervention in the Russian Civil War consisted of a series of multi-national military expeditions in 1918. The stated goals were to help the Czechoslovak Legion, to secure supplies of munitions and armaments in Russian ports, and to re-establish the Eastern Front. Overthrow of the new Bolshevik regime was an additional, covert motivation. After the Bolshevik government withdrew from World War I, the Allied Powers openly backed the anti-communist White forces in Russia. Allied efforts were hampered by divided objectives, war-weariness from the overall global conflict, and a lack of domestic support. These factors, together with the evacuation of the Czechoslovak Legion, compelled the Allied Powers to withdraw from North Russia and Siberia in 1920, though Japanese forces occupied parts of Siberia until 1922 and the northern half of Sakhalin until 1925. Boris Pavlovich Pustyntsev (Russian: Бори́с Па́влович Пусты́нцев, 2 June 1935, Vladivostok – 4 March 2014, Saint Petersburg) was a Russian human rights activist. He was best known as chairman of the charitable organisation St. Petersburg NGO. He was born in Vladivostok, Primorsky Krai, Soviet Union. Pustyntsev died after a long illness on 4 March 2014 in Saint Petersburg, Russia. He was 78 years old. ENS Gamal Abdel Nasser (L1010) is an Egyptian Navy amphibious assault ship, a type of helicopter carrier, of the French-designed Mistral class. It was originally built for the Russian Navy and underwent sea trials. Subsequently, the contract was cancelled by France and agreement on compensation reached with the Russian government. Egypt and France concluded the deal to acquire the two former Russian Mistral for roughly 950 million euros. Egypt is the first and to date only country in Africa and the Middle East to possess a helicopter carrier. FC Luch Vladivostok (Russian: Футбольный клуб "Луч" Владивосток) is an association football club based in Vladivostok, Russia. In 2005, Luch won the Russian First Division and played in the Premier League from 2006 to 2008. The club was called Luch-Energiya from 2003 to 2018, when it was renamed due to sponsorship from Dalenergo, an energy distribution company. Far Eastern Federal University (Russian: Дальневосто́чный федера́льный университе́т, Dalnevostochny federalny universitet) is a university located in Vladivostok, Primorsky Krai, Russia. FEFU was established in 1899 as the Eastern Institute (Восточный институт) as a higher education institution specializing in oriental studies and training for administrative, commercial and industrial institutions in the Far East. The university was reformed into State Far Eastern University (Государственный дальневосточный университет) by Far Eastern Republic authorities in 1920 during the Russian Civil War, until it was closed in the 1930s under Joseph Stalin. It was reinstated in 1956 as Far Eastern State University by the Council of Ministers of the USSR, two years after Nikita Khrushchev visited Vladivostok. In 2000, its English name was changed to Far Eastern National University, however the name in Russian remained unchanged and references to the university under its old name were common. In 2008, the university was reformed again by presidential decree into its current form, officially changing the name to Far Eastern Federal University and a new purpose-built campus planned. The university was merged with the Far Eastern State Technical University (FESTU), Pacific State University of Economics (TSUE) and the Ussuriisk State Pedagogical Institute (USPI).In 2013, FEFU opened a new campus in the Russky Island area of Vladivostok after its buildings hosted the 2012 APEC summit. The campus serves FEFU's 41,000 students, and hosts the annual Eastern Economic Forum. FEFU is a participant of the Project 5-100 state program of the Russian Ministry of Education and Science. Igor Kunitsyn (Russian: И́горь Константи́нович Куни́цын, born September 30, 1981) is a retired professional male tennis player from Russia. He made it into the top 100 for the first time in 2006, and reached a career-high singles ranking of World No. 35 in July 2009. Khabarovsk Novy Airport (Russian: Аэропорт Хабаровск) (IATA: KHV, ICAO: UHHH) is located at the eastern part of Khabarovsk, Khabarovsk Krai, Russia. Khabarovsk Novy Airport was the main hub for the Russian airline Dalavia, which was shut down by the government due to large debts. Vladivostok Air replaced the role of Dalavia, and Khabarovsk was "upgraded" into a secondary hub for Vladivostok Air. Vladivostok Air was later merged into Aurora. In 2015, Khabarovsk Novy International Airport carried 1,821,694 passengers.A small airfield is adjacent to the west side of Khabarovsk Novy, and is known as Khabarovsk MVL (малых воздушных линий, literally "Small Airlines"). It handles charter and general aviation operations, and has a runway length of 960 m (3150 ft). The Pacific Fleet (Russian: Тихоокеанский флот, translit: Tikhookeanskiy flot) is the Russian Navy fleet in the Pacific Ocean. Established in 1731 as part of the Imperial Russian Navy, the fleet was known as the Okhotsk Military Flotilla (1731-1856) and Siberian Military Flotilla (1856-1918), formed to defend Russian interests in the Russian Far East region along the Pacific coast. In 1918 the fleet was inherited by the Russian SFSR then the Soviet Union in 1922 as part of the Soviet Navy, being reformed several times before being disbanded in 1926. In 1932 it was re-established as the Pacific Fleet, and was known as the Red Banner Pacific Fleet (Краснознамённый Тихоокеанский флот) after World War II as it had earned the Order of the Red Banner. In the Soviet years, the fleet was also responsible for the Soviet Navy's operations in the Indian Ocean and Arabian Sea. Following the collapse of the Soviet Union in 1991, the Red Banner Pacific Fleet was inherited by the Russian Federation as part of the Russian Navy and its current name was adopted. The Pacific Fleet's headquarters is located in Vladivostok, with numerous facilities within the Peter the Great Gulf in Primorsky Krai, and Petropavlovsk-Kamchatsky and Vilyuchinsk in Avacha Bay on the Kamchatka Peninsula in Kamchatka Krai. Following the APEC Russia 2012 summit, it was announced that the main naval base of the Pacific Fleet in the Russian Far East will be moved to the town of Fokino, Primorsky Krai. The current commander is Admiral Sergei Avakyants, who has held the position since May 2012. Primorsky Krai (Russian: Примо́рский край, tr. Primorsky kray, IPA: [prʲɪˈmorskʲɪj kraj] is a federal subject (a krai) of Russia, located in the Far East region of the country and is a part of the Far Eastern Federal District. The city of Vladivostok is the administrative center of the krai, as well as the largest city in the Russian Far East. The krai has the largest economy among the federal subjects in the Russian Far East, and a population of 1,956,497 as of the 2010 Census.The name of the krai is derived from the Russian words "приморский" (primorsky), meaning "maritime", and "край (kray), meaning "edge" or "frontier". It is informally known as Primorye (Примо́рье, IPA: [prʲɪˈmorʲjɪ]) in Russian, and is occasionally translated as Maritime Territory in English. The krai shares Russia's only border with North Korea, along the Tumen River in Khasansky District in the southwestern corner of the krai. Peter the Great Gulf, the largest gulf in the Sea of Japan, is located along the south coast. Historically part of Manchuria, Primorsky Krai was ceded to the Russian Empire by Qing China in 1860 as part of a region known as Outer Manchuria, forming most of the territory of Primorskaya Oblast. During the Russian Civil War it became part of the Far Eastern Republic before joining the Soviet Union, going through numerous changes until reaching its current form in 1938. Primorsky Krai is home to the Russian Navy's Russian Pacific Fleet. The Trans-Siberian Railway (TSR, Russian: Транссибирская магистраль, tr. Transsibirskaya magistral', IPA: [trənsʲsʲɪˈbʲirskəjə məgʲɪˈstralʲ]) is a network of railways connecting Moscow with the Russian Far East. With a length of 9,289 kilometres (5,772 miles), from Moscow to Vladivostok, it is the longest railway line in the world. There are connecting branch lines into Mongolia, China and North Korea. It has connected Moscow with Vladivostok since 1916, and is still being expanded. It was built between 1891 and 1916 under the supervision of Russian government ministers personally appointed by Tsar Alexander III and his son, the Tsarevich Nicholas (later Tsar Nicholas II). Even before it had been completed, it attracted travellers who wrote of their adventures. The United States Pacific Fleet (USPACFLT) is a Pacific Ocean theater-level component command of the United States Navy that provides naval forces to the United States Indo-Pacific Command. Fleet headquarters is at Pearl Harbor Naval Station, Hawaii, with large secondary facilities at North Island, San Diego Bay on the Mainland. JSC Vladivostok Air (also Vladivostok Avia; Russian: ОАО Владивосток Авиа) (IATA: XF, ICAO: VLK) was an independent airline with its head office at the airport in Artyom, Primorski Krai, Russia. In 2011, it was reacquired by Aeroflot. Vladivostok International Airport (Russian: Международный аэропорт "Владивосток" Mezhdunarodnyi aeroport Vladivostok) (IATA: VVO, ICAO: UHWW) is an international airport located near Artyom, Primorsky Krai, Russia, roughly an hour's drive (44 kilometers) north of the center of the city of Vladivostok. It was formerly known as Knevichi Airport, named after the village of Knevichi. The Vladivostok Summit Meeting on Arms Control was a two-day summit held on November 23 and 24, 1974 in Vladivostok for the purpose of extending arms control provisions between the Soviet Union and the United States. After a series of talks between American President Gerald Ford and Soviet Foreign Minister Andrei Gromyko in Washington and American Secretary of State Henry Kissinger's visit to Moscow, Ford traveled to Vladivostok to meet with Soviet General Secretary Leonid Brezhnev directly. The two heads of state agreed to terms that would limit both nations an "equal aggregate number" of various weapons, including strategic nuclear delivery vehicles (SNDVs), intercontinental ballistic missiles (ICBMs), and submarine-launched ballistic missiles (SLBMs) fitted with multiple independently targetable reentry vehicles (MIRVs). Vladivostok Time (VLAT) (Russian: владивостокское время, vladivostokskoye vremya), is a time zone in Russia, named after the city of Vladivostok. It is ten hours ahead of UTC (UTC+10:00) and seven hours ahead of Moscow Time (MSK+7). On 27 March 2011, Russia moved to year-round daylight saving time. Instead of switching between UTC+10:00 in winter and UTC+11:00 in summer, Vladivostok Time became fixed at UTC+11:00 until 2014, when it was reset back to UTC+10:00 year-round.